The following recipe was made for my guests during my Fall Snacks cooking class. You can read and view links to other recipes I made HERE. - Preheat oven to 375 degrees F (190 degrees C). - Roll out crescent rolls onto a large non-stick baking sheet. Stretch and flatten to form a single rectangular shape on the baking sheet. Bake 11 to 13 minutes in the preheated oven, or until golden brown. Allow to cool. - Place cream cheese in a medium bowl. Mix cream cheese with 1/2 of the ranch dressing mix. - Adjust the amount of dressing mix to taste. Spread the mixture over the cooled crust. 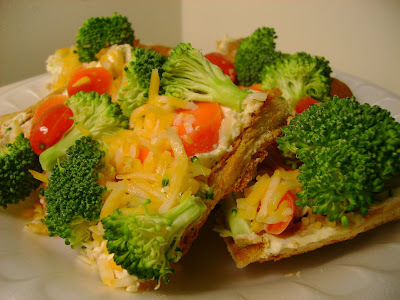 - Arrange carrots, broccoli, and tomatoes. - Sprinkle cheese over top. - Chill in the refrigerator and cut into bite-size squares to serve.